Yet again, we are taking customer support up a notch by integrating Salesforce CRM, the world’s leading customer relationship system, with Kayako. The latest research reveals that over 80% of companies known to deliver outstanding customer experience, are actually outperforming their competition. Such stats put all the more emphasis on the indisputable importance of providing an exceptional customer service. 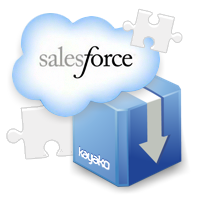 The two-way integration of Salesforce CRM and Kayako, the industry leading CRM and help desk systems, will make sure your company builds strong, long-lasting customer relationships. A unified view of sales, marketing and support ticket data available from either Salesforce or Kayako, will ensure that sales reps and managers have everything they need to provide fantastic customer experience while driving more sales and cutting costs at the same time. - make sure your employees have all the information they need at their fingertips to communicate and engage with customers in the most efficient manner. * Your organization must use either Enterprise Edition, Unlimited Edition, or Developer Edition.